Holiday day dreaming – where to next? I have always loved to travel and since the boys came along while our travel plans have altered somewhat we still love to travel as a family. As the Dada Fairy says im always plotting and planning the next trip! My sister honeymooned in Mexico recently and made us insanely jealous with her tales and photos of blue skies, crystal clear waters and stunning resorts. While we have travelled extensively neither of us have been to Mexico and to be honest rightly or wrongly I had this idea it might not be that child friendly. However I have no problem admitting when im wrong and my sister informed me that it is indeed incredibly child friendly….and with that researching another long haul family trip began. Los Cabos – Where exactly is it? Los Cabos is located at the Southern tip of Mexico’s California Peninsula, it encompasses the towns of Cabo San Lucas and San Jose del Cabos. I believe this area has only really risen in prominence in recent years as a tourist destination when the Mexican Government actively began to market it as a tourist hot spot. I understand the tourist industry is the biggest one here providing a huge chunk of this areas employment. I doubt it needs much of a marketing push with the draw of it is clear skies, blue seas and warm sunny temperatures. I understand that the area receives over 2 million visitors a year! I had to see what all the fuss is about! When travelling with kids for me personally I like to stay in houses/ apartments. Having the option to make our own meals and the space to chill when kids go to be early is a very important decision for us. Check out these utterly amazing Los Cabos Villas the views!!! I will be day dreaming about these properties for the next while. These villas cater for larger number so making them the perfect extended family get away. This is another important consideration for us as my parents often travel with us, thereby making villa or apartment stays the perfect choice. What do in Los Cabos with kids? Straight in at number one has to be some beach time! Miles (about twenty of them!) of beach and blue waters make this an obvious attraction. Although according to my sister the waters can be quite cold and can have strong currents so do always obey the signs and instruction of life guards. Whale Watching – you couldn’t go all this way and not look out for these incredible creatures. Los Cabos is alleged to be one of the best spots in the world to spot whales particularly during the months December – March. 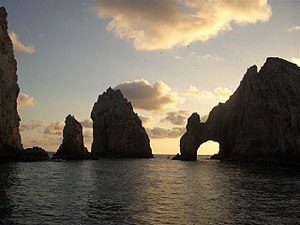 The stunning Arch of Cabo San Luca (pictured above), this is a synonymous site with this area and a must visit. Take a boat around it or even stop off at the beaches there – my idea of bliss! Take a yellow submarine – I kid you not! You can take an hour like trip in a yellow submarine that get you up close and personal with the sea life in Los Cabos including a close encounter with the stunning Arch. Sample the array of eateries, from farm fresh to pizza it’s all catered for here. I have been reliably informed that no visit is complete without a visit to Flora’s Field Kitchen which is a working farm serving meals from the farms produce. Certainly pricey but you go for the entire experience and if what I have been told is correct this is an experience you will not forget in a hurry. There are also plenty activities on offer locally from snorkelling to camel rides, to picturesque horse back rides and for perhaps older kids or the more adventurous adults there is also a zip-lines and ocean riders (high speed boats). Safe to say there is pretty much something for everybody with most ages groups catered for. Well I think my mind is made up, the whole places sounds idyllic. I’m off to research flights. If you have been do let me know and leave your tips or attraction recommendations below in the comments section. Note: This post is in collaboration with Luxury Retreats however I retain full editorial control over the content.